In recent years, many important discoveries have been made in global deep oil and gas exploration, which indicates that deep exploration has gradually become one of the most important areas in current and future hydrocarbon exploration. However, the prediction of deep reservoirs is very challenging due to their low porosity and complex pore structure characteristics caused by the burial depth and diagenesis. 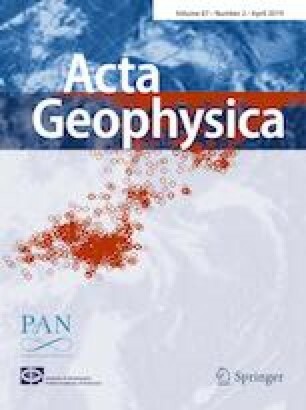 Rock physics provides a link between the geologic reservoir parameters and seismic elastic properties and has evolved to become a key tool of quantitative seismic interpretation. Based on the mineral component and pore structure analysis of studied rocks, we propose an improved rock-physics model by introducing a third feldspar-related pore for deep-buried sandstone reservoirs to the traditional Xu–White model. This modelling process consists of three steps: first, rock matrix modelling using time-average equations; second, dry rock modelling using a multi-pore analytical approximation; and third, fluid-saturated rock modelling using a patchy distribution. It has been used in total porosity estimation, S-wave velocity prediction and rock-physics template establishment. The applicability of the improved rock-physics model is verified by a theoretical quartz-water model test and a real data total porosity estimation compared with the traditional Xu–White model and the density method. Then, a rock-physics template is generated by the improved rock-physics model for porosity and gas saturation prediction using seismic data. This template is carefully calibrated and validated by well-log data at both the well-log scale and seismic scale. Finally, the feasibility of the established rock-physics template for porosity and gas saturation prediction is validated by a deep-buried sandstone reservoir application in the East China Sea. This work was financially supported by the Natural Science Foundation of China (41674139) and the National Science and Technology Major Project (2016ZX05033-02). We thank the Sinopec Shanghai branch for data provided and permission to publish the results of this research. Yaneng Luo would also like to thank the Basin and Reservoir Studies (BRS) group at University of Bergen for hospitality and support during his one-year visit.